Flowering: May-September. 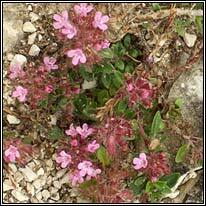 Dwarf shrub. Native. 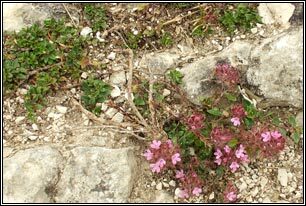 Small pink-purple flowers in rounded heads on erect stems. Oval-rounded, evergreen leaves are small, un-toothed. Hairy. Spreading, rooting stems. Plant forms dense, slightly aromatic mats. Height: 3-7cm. Very frequent on coasts, local inland. Dry ground, rocks. 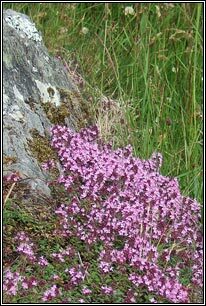 Similar: Large Thyme, T. pulegioides. 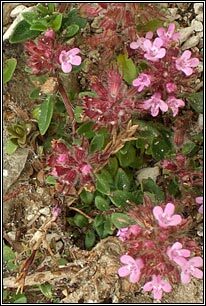 No longer found in Ireland, but has been recorded here.